Would you like to learn more about Lirianne, the Iconic Gunslinger? 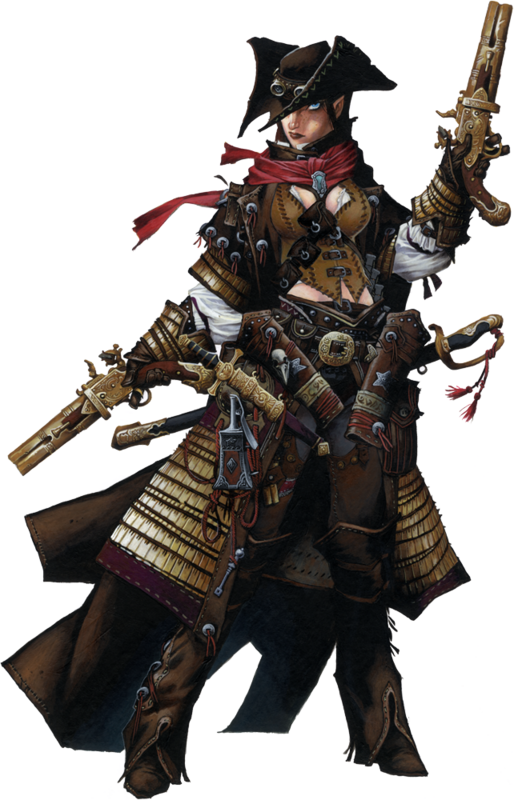 Read her Meet the Iconics entry over at the Paizo blog, or any of the other blog posts that mention her! Shieldmarshal Dahmok's greatest failing was teaching his middle daughter to read. After the loss of their mother, a lively but capricious elven explorer who viewed ten years and three children as a "fling," he had hoped to rear homebody children. Even with their halfblood status stretching the years he spent with his treasured children, the old marshal shuddered at the knowledge that one was already slipping away. While older Suzeressa took to the practical household arts and younger Milliceene pursued a love of natural sciences, middle-born Lirianne lost herself for hours at a time in tales of shining knights, devious fairies, and mighty dragons—all subjects absent from her homeland of Alkenstar. Raised among bricks, smoke, and bureaucracy, the young half-elf dreamed of the life of adventure and fantasy promised by the collection of fairy tales left by her absent mother and her own ever-growing library of penny dreadfuls. Naturally, she aspired to follow in her father's footsteps and become a shieldmarshal, protecting Alkenstar from the hostile giants and hideous mutations of the Mana Wastes. Preferring to keep his little girl safe at home, Dahmok calmly explained she could never become a shieldmarshal, running with the first excuse he could come up with—that her beloved long hair would become entangled in firearm mechanisms. To his surprise, he awoke the next morning to discover Lirianne grinning like a fool, with her long tresses roughly chopped, eagerly packed and ready to follow him to work. For twenty years, the little half-elf pushed herself to meet ever more insane requirements laid down by her aging father. Schoolmates nicknamed her "the Phantom" as she vanished often to practice her quick draw or memorize technical volumes. Tutors and governesses thought her adle-brained as she sat staring, redrawing engineer's schematics in her mind rather than follow her lessons. Even before she was old enough to entertain her first romance, she had mastered the construction and firing of a rifle, and could reckon complex trajectories by eye alone. An old man and long since retired by the time his daughter reached womanhood, Dahmok could no longer forbid her entry into the shieldmarshals. But the old patriot's influence lived on in his successors, and to honor his service they assigned Lirianne to a quiet domestic position, safeguarding farming settlements along the secure Alkenstar-Martel road. Ten years of her life passed rounding up drunks and mediating water rights, eating away at her passion for adventure in ways her father's disapproval never could. Her childhood dreams eventually forgotten, Lirianne's steely eyes dulled with the tarnish of a thousand mundane details. It was kismet when a storm of wild magic blew off the Spellscar Desert, past Alkenstar, and into her jurisdiction. The rampant arcane energy, fallout from centuries of wizard warfare, warped space and time around it. The magical swells lashed out, reshaping hillsides, boiling sand into glass, and calling forth bizarre creatures from the dawn of history. The only marshal at hand, Lirianne leapt into service. As townsfolk huddled in their cellars and buildings crumbled into twisted forms of misbegotten wood and bone, a bolt of green lightning lashed out, striking the half-elf even as she confronted the storm's abominations. Lirianne awoke soaking and half-drowned on distant shores. The bizarre country was flush with thick forests and green hills—plant life like she'd never seen. Wandering inland, she soon encountered a lumber caravan beset by malicious fey. In a heartbeat, a childhood's worth of stories welled up inside her, and she rushed into battle with a passion long since forgotten. The grateful caravan loaded her with all the supplies and information she could manage, confirming that her inexplicable odyssey had deposited her cleanly in the midst of those same shining knights, devious fairies, and mighty dragons who had occupied so much of her youth.